The DWT Doonz tires for sand have awesome steer-ability. Super fast sand dune tires climb without power loss. Feel the difference with these extremely light DWT Doonz tires. The DWT Doonz sand tire has a 8 paddle design. 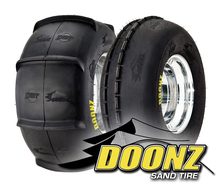 These Doonz tires work great on the Polaris RZR, Yamaha Rhino and Can-Am Commander Wildcat UTV and side x side. Light weight and 2 ply rated. V-paddle rear sand tires deliver awesome steer ability and fast sand dune climbing capability without any power loss. Float across sand dune.. This DWT Kit come with 2 Doonz tires mounted on Polished .190 alloy race rims. all you need to do is bolt on and go.